Overcast and quiet this Wednesday morning on California’s north coast. Although the NWS calls the weather ‘partly cloudy,’ there’s a great-deal of good-old-fashion Pacific fog drifting around in there, too. Rain prospects for this weekend are starting to look dinky. Although Prop 19 was defeated at the polls five years ago, the margin of victory was dinky. 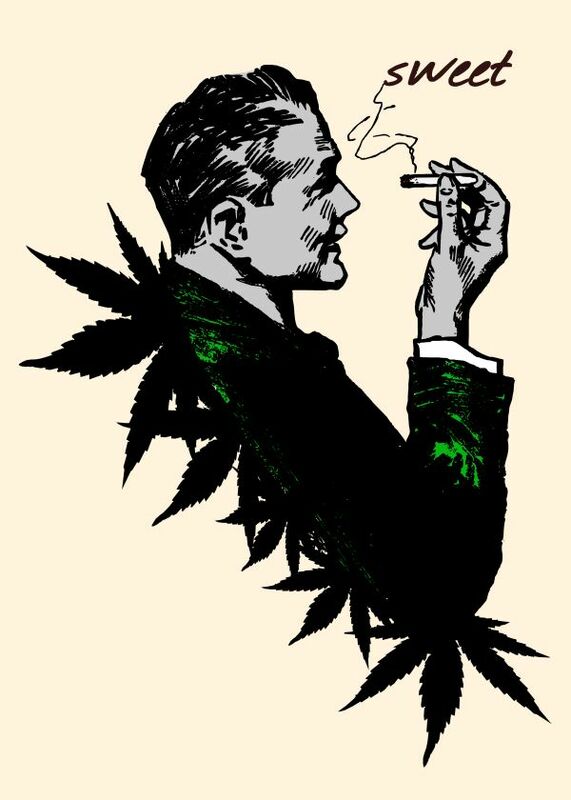 (Illustration: ‘Cannabis and Politics,’ by Denis Marsili, found here). Yet on that toke, marijuana still ain’t legal. Last weekend, initial action to maybe change that as the Coalition for Cannabis Policy Reform announced the first move to get a California legalization initiative on the ballot next year. Requirements for the ‘Circulation’ language used to get petitions signed and onto the ballot has been filed, and then to be OKed by the Attorney General. The initiative seeks to tax and regulate cannabis for those 21 and older, who would be able to possess one ounce without fear of arrest. It would also create an Office of Cannabis Regulation under the California Department of Consumer Affairs. Retailers, growers, distributors and transporters would have to obtain state licenses. The proposal could end up being one of more than a half dozen. It appears that former backers such as the Drug Policy Alliance and the Marijuana Policy Project have pulled their support, at least for now. Billionaire tech titan Sean Parker is working on his own initiative. And DPA has its own language waiting in the wings too. A handful of grassroots efforts are also aiming for the ballot. Seems a fair approach, and hopefully will make it to the voting booth. Feedback to the coalition at its Facebook page. In that expanding context in the changing views on marijuana, the next logical step is a deep-dish media procedure, a ‘reality-TV’ type vehicle about the authenticity of pot with society. Faster-than-you-can-burn-a-bowl, the genesis behind a pot channel, which will depict the wonderful, wide world of marijuana, in all its manifestations. It’s called Cannabis Club TV, or CCTV, the brainchild of Danny Keith and Pete Biggam. The two Santa Cruz partners with tattoos and hipster get-ups happen to be pot consumers themselves for, you know, those nasty aches and pains. Their goal is to provide a platform for marijuana advertisers to reach potential customers — a burgeoning pot business community that is now, unlike the large U.S. pharmaceutical firms, precluded from such conventional outlets as TV and newspaper advertising. Instead, they will watch a stream of content that is all things marijuana. For now, they are constantly searching for those who want a place on their new platform. Over the weekend, they manned a booth at the second annual Hempfest Carnival and Marijuana Expo, held in an open-air parking lot just east of the Strip. On Saturday night, the place was a pot-smoker’s paradise: The strong aroma of cannabis wafted into the early-October air at a scene that boasted all the sophistication of a county fair midway. Rappers belted out pot-themed riffs on two stages. At the CCTV booth, Keith and Biggam discussed what they consider to be their first brilliant marketing strategy: a partnership with actor-comedian Tommy Chong, godfather of all stoners. Chong, 77, remains an advocate of legalized marijuana who believes that regular use of the drug helped him beat back prostate cancer in 2012. This year, he announced that he has been diagnosed with rectal cancer and has started a cannabis regimen. Not just burning a joint, but using the various medical strains of the plant — cannabis reality.